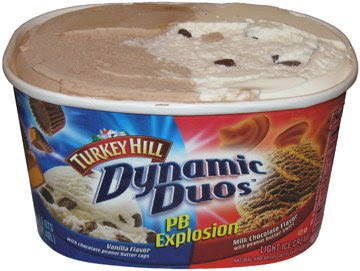 I know it took awhile, but I finally tried one of Turkey Hill's dynamic duos. There are currently 4 duos to chose from and the one that caught my eye the other day was the PB Explosion. The "red" side is a milk chocolate with peanut butter swirl, which just so happens to be the exact same description as my old favorite TH Chocolate Peanut Butter Cup. The "blue" side is vanilla with mini peanut butter cups. At first I was debating maybe only trying one side tonight, but then I couldn't resist and had to try both. I started my adventure by digging out the pb cups...What can I say, they were just sitting there on top staring at me! Tasty little buggers. Then I took some bites of the vanilla ...Nothing special here, kinda bland actually. Next was the other side and it sure does look good. You never forget a flavor like TH chocolate PB cup and so I already knew what to expect ...but I was wrong, oooooo so wrong. Unfortunately this light milk chocolate doesn't taste nearly as good as it looks, in fact, it doesn't really have any taste at all! It was a little disturbing actually, but maybe the peanut butter will save it. Nope! the bland chocolate mixed with this particular PB is borderline unpleasant....no, let's call it like I taste it: it is unpleasant. This dynamic duo has made a lousy first impression on me. The vanilla pb cup side isn't bad thanks to the pb cups, but the milk chocolate with peanut butter swirl is just awful. Wow, this just doesn't seem right. None of the cold-churned stuff has been flavorless, so I don't know what's up here ...but I am disappointed. On Second Scoop: I still don't know what's up with this flavor, but I'm starting to wonder if they messed with the peanut butter swirl in an attempt to lower the fat content. Mix that strangest with the mild/bland milk chocolate and you set yourself up for a disappointing ice cream. Triple Scoop: I waited a few weeks and decided to attack the vanilla pb cup side with a renewed sense of hope. Well, my hope was worn away by the disappoint of this flavor. The blog makes it obvious I'm a huge TH fan, but I'm really disappointed with this one. The bleach white vanilla...wait, actually, calling it vanilla seems like an insult to other vanilla based flavors. You would hope the pb cups could save this flavor, but they cant. They're ok at best. I just can't recommend this Duo, not even a little.